Reduce. Reuse. Recycle. Reston! | Where Outside Is In! We’re hosting the fourth R4 Collection Day: Reduce. Reuse. Recycle. Reston! on Wednesday, April 21 from 1 pm until 4 pm. In an effort to provide awareness and options for disposal of items that can be diverted from landfill, specific items listed below will be accepted for collection at the Reston Town Center Pavilion, 11900 Market Street, Reston, VA 20190. We’re partnering with a number of groups that will be on site to collect used items and supply information on recycling, including: Bikes for the World (bicycle and sewing machine collection); Lions Club of Reston (eyeglasses and hearing aids collection); Secured Shred (document disposal); and Turtle Wings (computers and other electronics collection). 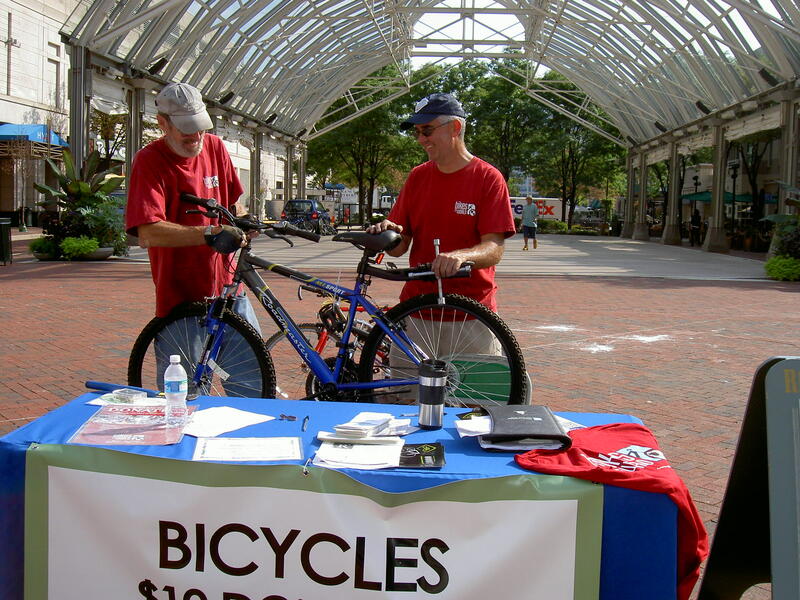 A $10 donation with your old bike will repair it for re-use with Bikes for the World. The first three R4 Collection Days resulted in tons of electronics for recycling and paper shredded on site, and hundreds of eyeglasses, bicycles and portable sewing machines for repair and re-use for shipment to underprivileged areas of the world. 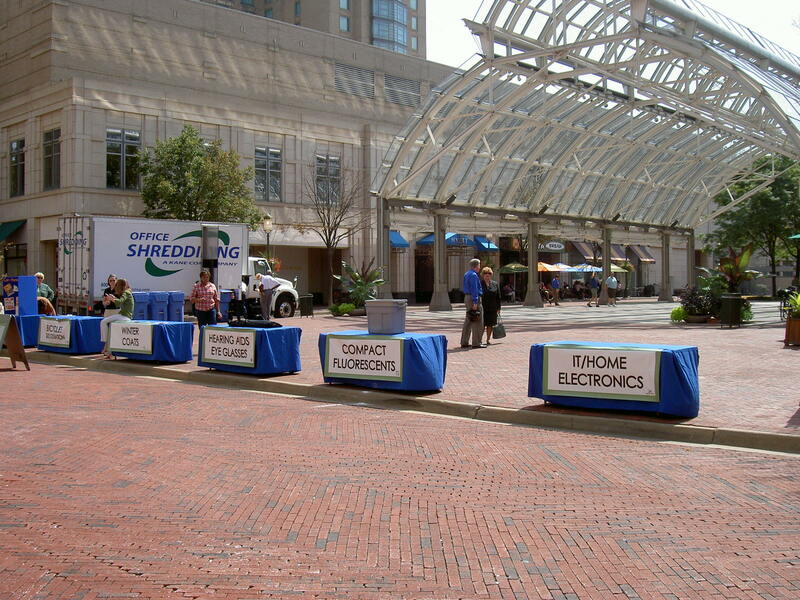 Reston Town Center plans to continue with holding this event twice a year, as demand requires. The next R4 Collection Day will be scheduled for September 2010. Only the items listed below will be accepted at the R4 Collection Day. NO hazardous waste items. Items will only be accepted from 1 pm until 4 pm, and must be delivered directly to the appropriate collection booth. *Electronics, collected by Turtle Wings, include: Answering machines, cables, camcorders, CDs, CD players, cell phones, computers, cords, DVDs, DVD Players, electric typewriters, electronic games, fax machines, keyboards/mice, hard drives, ink/toner, laptops, laptop batteries, mainframe equipment, microwave ovens, modems, monitors, networking equipment, pagers, PDAs, printers, printed circuit boards, radios, remote controls, scanners, stereos/components, tapes, tape players, telephones, telecom equipment, televisions, two-way radios, UPS-power supplies, VCRs, word processors. Established in 1990, beautiful Reston Town Center is an acclaimed outdoor venue offering more than 50 retail shops, 30 restaurants and a 13-screen cinema, plus more to come. At the Center’s hub, the Pavilion hosts special events, concerts, festivals throughout the year and ice-skating in winter. Find more information on shopping, dining and events at Reston Town Center, Find us on Facebook and follow us on Twitter. Address: 11900 Market Street, Reston, VA 20190 Directions: From I-495, take I-66 west to the Dulles Toll Road (Exit 12, Route 267 West) to Reston Parkway (Exit 12). Turn right on Reston Parkway then left on New Dominion Parkway (4th light). This is great — I have several things to donate — just in time for Spring cleaning. Can you get a donation receipt from these organizations at the event? Sorry, no receipts are given. However, when you recycle your bike with the $10 donation (to cover the cost of repairs through Bikes for the World) you can get a receipt if you like. Happy recycling! I have a very heavy TV I’d like to recycle (27″ tube TV). Will someone be available to help me get it out of the car? When is the recycle event. It says above that it will be on Wednesday, April 21, but the 21st is a Thursday. Will the event be on Wed. April 20 or Thursday April 21? « Reston Tour de Cure – Kick Off!